According to Wikipedia: Pumpernickel is a very heavy, slightly sweet, rye. It originates from Germany where it was derived using a combination of rye flour and whole rye berries. Traditionally made with a sour dough starter it got its dark color from the long baking period. Now a days the North American version is darkened by adding molasses, coffee or often cocoa powder. Why am I telling you this? Well first because I find it very interesting and secondly because today's recipe features pumpernickel four. Remember I told you early in the week that my Virtual Potluck group was teaming up with King Arthur Flour and Red Star Yeast to bring you some awesome recipes and a give away...this is another one of those recipes. One of the ingredients I was given to work with was pumpernickel flour. And one of the first things I thought to make was bread sticks. Why bread sticks. Well I'll be honest. I needed something to bring to a dinner party. I was in charge of the appetizer...the theme was Italian. Hence Pumpernickel Rosemary Grissini were born. Mix all of your dry ingredients together in the bowl of a food processor. Mix your water and oil together. With the processor running slowly add your liquids and continue to mix until a ball forms. Turn out onto a floured surface and gently kneed by hand. Place dough in a nonreactive bowl and cover. Let rise about 90 mins. Dough should double in size. When ready cut dough into two equal pieces. Working with one at a time roll dough out into a rectangle. Using a pizza cutter slice dough into 1/4 inch thick strips. Roll each strip between your fingers to create a rope effect. Lay ropes in a pan lined with parchment. Brush each rope with olive oil and sprinkle with course sea salt. Bake for 30 mins. rotating mid way so that the grissini cook evenly. Wow, sounds so easy! I'm not a huge fan of rye, but pumpernickel with the addition of rosemary sounds like it would be worth a try. What are the three dipping sauces in the photo? Love that they are Italian flag colors! yum! that grissini sounds delicious! mmm! thanks for sharing! 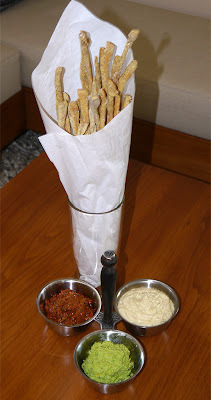 I've never had anything other than the regular pumpernickel bread or bagel, so these grissini look awesome to me! And so do the dips...I'd never leave its side! Your grissini rock! I love the assortment of dipping sauces too. this is very interesting! It looks so delicious especially with the pumpernickel flavor! You can come to my house for a dinner party anytime with these in hand!